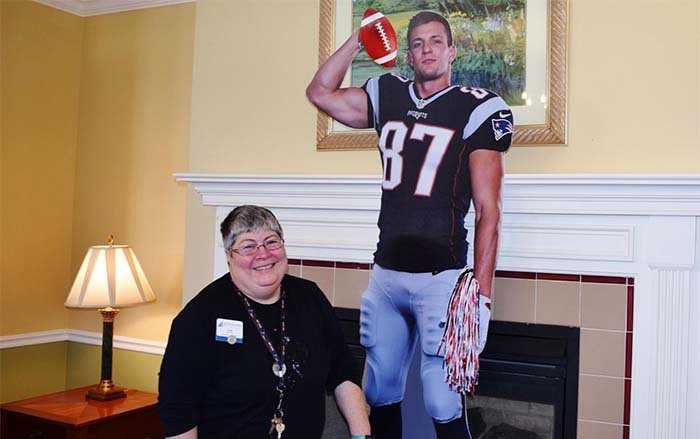 Cambridge College Alumna Lois Abramo, Program Director at Benchmark Senior Living in Franklin, poses with cardboard cutout of Rob Gronkowski, Patriots' tight end. Program Director Lois Abramo unfailingly places her life-size cardboard cutout of Gronk in the main room any time the Patriots play, both for good luck and to remind her of the eight years she spent working for the team. The Norfolk resident and past season ticket holder worked at the Patriots Hall of Fame museum at Gillette Stadium from 2010 to last May. She coordinated field trips, provided tours and had the chance to meet many of the players. Many people, she said, don’t know the museum exists, though busloads of students on field trips come through the doors nearly every day. With a masters degree in education from Cambridge College, she once taught special education and math, along with working at Dean College as an academic coach. She took her skills to Patriot Place and made a name for herself guiding field trips, among other things. Half of the students work on math lessons using player stats and fake money to draft their own players and make logos for their team, while the other half tours the museum, she said. There were also science lessons that Abramo taught using Styrofoam to make helmets that might prevent concussions. She said that season ticket holders get in for free and that a lot of libraries carry discount coupons. Otherwise it’s only $10 to enter and every Patriots fan should take a walk through, she said. At the museum, she said, visitors can also try on equipment from the players in a locker room that looks exactly like the real one. The point, she said, it to show how big the players actually are. One of the biggest perks, she said, was trying on the many Super Bowl rings, which now number six after Sunday night’s win over the Rams in Super Bowl LIII. Though she doesn’t own any of the rings, her boss at the time would lend them to her for a quick selfie. She said that Sunday night at the senior living facility things were “pretty crazy” for the big game. Football squares, raffles, and a array of appetizers made Benchmark the place to be for the Super Bowl, she said. Workers at Benchmark paid $3 to wear Patriots gear to work on Sunday. All of the money was donated to the One Company Fund.